Ithaca, NY — Thanks to a $297,000 grant from the Institute of Museum and Library Services (IMLS), Cornell University Library will preserve and digitize a unique collection of ephemera, published materials, and artifacts from U.S. national political campaigns (1800-1976) and make the information available and searchable on the Web. The grant is one of eighteen IMLS 2001 National Leadership Grants for Libraries. The goal of the project is to make more widely known and accessible the Susan H. Douglas Collection of Political Americana in Cornell’s Division of Rare and Manuscript Collections. Cornell University Library (CUL) acquired the collection from an individual collector in 1957. Notable for its range and variety of content, the collection includes buttons, badges, posters and prints, songbooks and sheet music, cartoons, parade equipment, and souvenirs such as plates, cups, and games. There are approximately 5,500 objects of political memorabilia dating from 1789 to 1960. 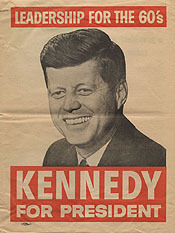 In addition to the Douglas collection, the library will also conserve and digitize approximately 1,500 similar items covering campaigns from 1960 to 1972, which are found among its other manuscript collections, and several hundred other works of campaign literature found in its rare books collection. Cornell expects to finish the project in time for the next presidential election, making available an important collection of material of broad interest to historians, political scientists, and children in K-12 educational institutions. The finished collection will be represented by more than 35,000 online images. CUL will create an online database with linked images that can be searched by year, by candidate, and/or by format, bringing the riches of this collection to anyone with access to the Internet. These items have a broad appeal for students, historians, and the general public. The campaign memorabilia in the Douglas Collection are a particularly rich resource for the study of not only American political history, but its social and cultural past as well. Through their images and text, design and materials, the pamphlets, posters, political cartoons, and souvenir items offer direct access to an important aspect of the lives of everyday people. Beyond the immediate goals of promoting presidential candidates and their parties, these campaign objects speak their own language. While they often incorporate words, they primarily convey visual images with strong emotional overtones and social implications that transcend verbal communication. Although individual items are often used as illustrations for books and articles, the fragile nature of many of these objects limits the use of the originals for research and teaching to those who can make the trip to Cornell’s Carl A. Kroch Library, where the collection is stored. By creating digital surrogates, the library will dramatically increase the availability of these artifacts and printed materials to both scholarly and popular communities world wide. The conservation component of the project will entail a comprehensive survey of the material in the Douglas Collection. Over the next two years, CUL’s Department of Preservation and Conservation will examine the fragile glass, ceramics, metals, textiles, posters and prints in the collection and conduct appropriate conservation treatment, including cleaning, stabilization, and repair. The conservation staff will also construct new archival boxes and folders to meet the specific preservation and storage needs of the artifacts. Cornell’s digitization project also will serve as a model for other institutions that possess artifacts and wish to integrate them in their digital libraries. Cornell University Library has been a pioneer in the conversion of traditional printed library material to digital form. More recently, and in collaboration with the university’s museum, the library has turned its research attention to the digitization of artifacts. Through this project CUL will develop a methodology that will be of use to any library or museum engaged in digitizing printed materials and artifacts. Cornell is committed to developing and maintaining high-quality, reliable digital image collections. The Political Americana Collection will be an integral part of this larger effort. The project is a joint venture among CUL’s Department of Preservation and Conservation, Division of Rare and Manuscript Collections, and the Cornell Institute for Digital Collections (CIDC). The Institute of Museum and Library Services is an independent Federal agency that fosters leadership, innovation, and a lifetime of learning by supporting the nation’s 15,000 museums and 122,000 libraries. For more information, contact Eleanor Brown, Head of Program and Project Management in Cornell’s Division of Rare and Manuscript Collections, at 607-255-3530 or email: <eb89@cornell.edu>. For information regarding copyright issues and securing permission to publish digital reproductions of images from the Cornell University Collection of Political Americana, please consult our Copyright & Permissions Page. For questions or comments about the site, send mail to: webmaster.